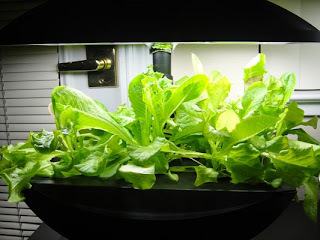 It’s been almost 4 months since I started growing my AeroGarden and Prepara Power Plant Professional indoor. I feel like doing a final review for my first season. First of all let’s take a look at how they were in early February. 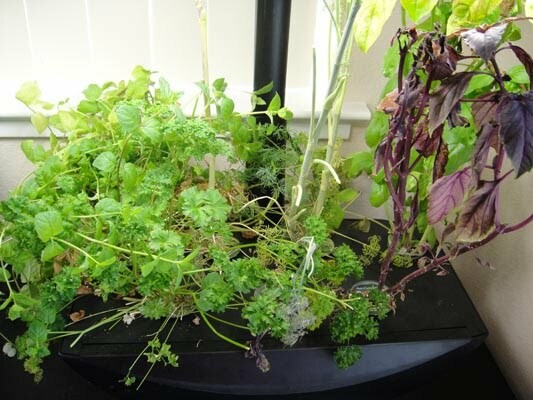 I switched the Cilantro/Parsley and Basils’ locations because my Basils grew really fast. I was hoping that they got more space at the side. 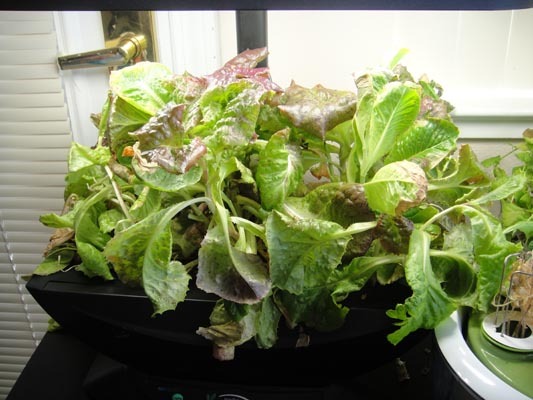 Salad Greens were still at early growing stage. Power Plant Pro after the tangling accident happened in mid January. The tomatoes got snapped right in the middle. It’s very sad. The following photos were taken today as of March 24th, 2010. AeroGarden Herbs are almost at the end of their life cycle. I ran out of tablets too. The Basils and Dills were doing good. I got plenty use from them. Cilantros and Parsleys were also OK. The only problem I had with Cilantro is that they tend to knee down on me, so I had to lean them on the Mints. I was too lazy to get a plant tie. My Chives never grew enough for me to use because there weren’t enough sprouts to start with. Mints grew the wildest among all the herbs even though I don’t find it useful. AeroGarden Salads are now at their mid growing stage. I still got about a month worth nutrient tablets left. This has been the easy to grow. Prepara Power Plant Pro (sadly dead already). There was some issue with the watering system. 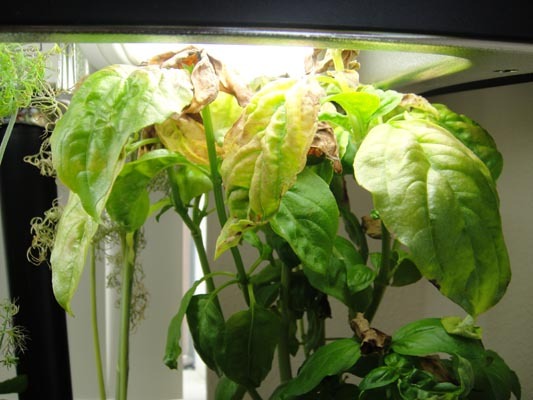 I always filled the nutrient water at the top line and I think it may caused the rotting root problem. I planted Rosemary twice but it never sprouted and over time other herbs also grew molds at the root area. When I noticed the problem, it’s already too late. The whole thing never recovered. 1. For bushier herbs, weekly pinching and harvest is required. Or otherwise you’ll end up having tall and thin plants like me. This is NOT good. My Basils leaves are all burned by the lamp heat. 2. Dry and dead leaves need to be removed promptly before they get out of control. 3. Of course you need to add water and tablets when needed. In other words you need to show your love to your plants. Other than that there’s really not much to do. 1. Fairly easy for beginners and lazier people. The seeds are pre-potted. 2. It can grow anywhere even without sunlight. Comes with grow lamps. 3. The control panel is well designed. It tells you when to add water, nutrients, etc. It also works for different types of plants, Herbs/Basil, Salad Greens, Tomatoes/Peppers, Flowers, and even Strawberry. 4. No extra bottle needed for storing nutrient water but tablets could get messy when absorbing moist. 1. The lamp hood isn’t tall enough even with 4 settings you can’t get the lamp to raise very high. 2. 7 pot machine is a little bulky. 3. Lack of built-in stem support. 4. Cost is high. The machine and pre-seeded pots. I feel like I have no rights to talk about it since I’m totally failed at my first season. I’m only be able to share some of the lessons I learned. Hopefully my next season will be better. 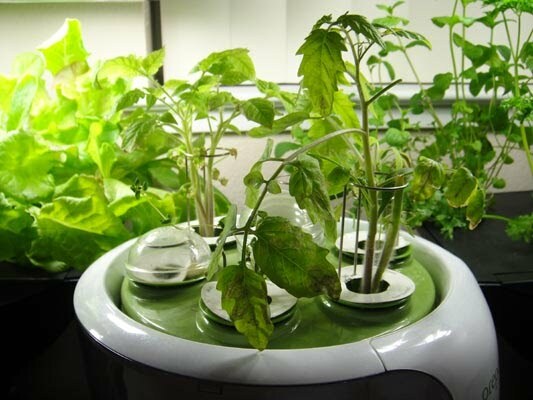 Power Plant Pro can be an alternative to AeroGarden. That is when you can manage to make it work. There’re a major reasons that I don’t like the Pro. 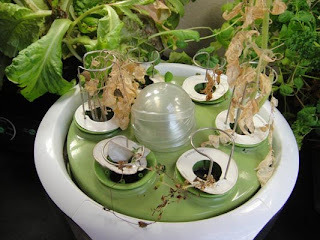 One is the spinning technic which supposed to help all plants get equal amount of sunlight. I just think it’s a stupid idea. It’s not going to make a huge difference if you can get sunlight to start with. If not then you are going to need a grow light kit which will raise the price to the AeroGarden. 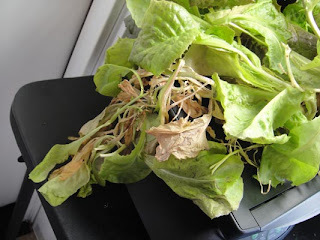 As for the root rotting problem, I have yet to figure out. Also seeds are going to make a difference. Cheap seeds won’t work. It’ll only be a waste of time. Which one do I prefer? 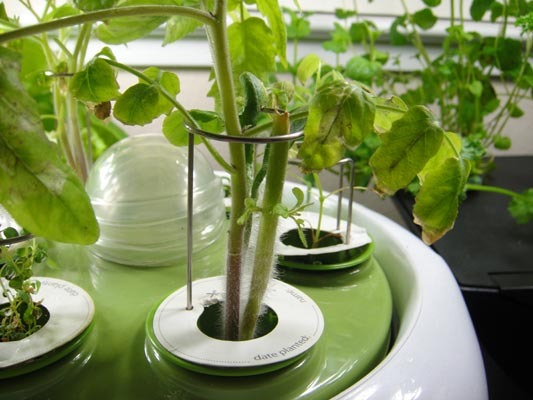 I say AeroGarden. Simply because it works for me. Remember you get what you pay for. Are they worth the money? I say probably no. Considering how much money and time it takes to grow your herbs or salads, it’s so little. You can’t expect to have dinner sized salad every night. It’s more for fun and a little home project that you can share with your kids. After all nothing be beat a smile from your kids when they watch their plants grow. i LOVE gardening ! And have around 12 pots at home, since i live in an apartment its not possible for me to have a huge garden, but hopefully some day ! !